I'm interested in compiling a list of bookstores around the world that stock a good selection of high-level mathematical books. The aim is so that a mathematician travelling, or on holiday, can easily check the list to see if there is a book store nearby that she or he could happily spend an hour browsing in. It must be a physical bookstore. It should have a good selection of research level books. This criterion is designed to exclude stores that stock primarily popular books and undergraduate textbooks, such as some university and chain bookshops. The Cambridge University Press bookshop in Cambridge, UK is a lovely shop with nine bookshelves of mathematical books. 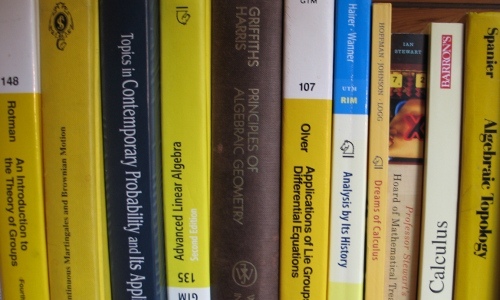 There's approximately one bookshelf each for algebra, analysis, number theory, combinatorics, methods, geometry, probability & statistics, and recreational mathematics. They stock only books they publish themselves (of which there are several thousand mathematical ones), including a good selection from these series: Cambridge Mathematical Library, Cambridge Studies in Advanced Mathematics, the LMS Lecture Note series. Powell's Books Bldg. 2, 40 NW 10th Ave.
Two in New York City: The Strand, Broadway and 12th Street, and the original Barnes and Noble, 5th Avenue and 18th Street. I think, some less known shops need an advertisement. Independent University of Moscow (here is a link http://ium.mccme.ru/english/ to an English web-site) is a wonderful place itself and also runs its own bookshop. Most of the books are in Russian, but the choice is wonderful and the place is worth visiting for at least one hour even if you don't speak Russian! I haven't been there in a while, but Foyles (in London) used to have an excellent selection of mathematics books. Black Oak Books on San Pablo Avenue in Berkeley, CA, has a good selection of research level mathematics books in the store front and also 'in the back'. It is run (it was the last time I was there, at least) by Gary Cornell, a number theorist (although I'm not certain to what extent he is still involved in research), and he seems keen to speak with mathematicians that drop by. In Paris, there's Gibert (26-34 Boulevard Saint-Michel). It's a giant bookstore with several floors of books including one whole floor devoted to scientific books. A sizable part of that floor is dedicated to maths, and there are enough books that they're sorted by subject (number theory, algebra, analysis, ...). During Springer's yellow sale, there's a big table overflowing with cheap Springer books, including many tomes of Bourbaki. If you go, there's a high risk of running into somebody you know. In Warszawa (Warsaw), Poland, one can buy lots of interesting stuff directly at the Central Mathematical Library located in the building of the Institute of Mathematics of Polish Academy of Sciences (3rd floor, ul. Śniadeckich 8, 00-956 Warszawa, Poland). In Berkeley, California, Moe's Books, just north of Dwight Way on Telegraph Avenue, has a nice selection of used math books on the third floor. I've found a few gems there. There's a bookstore called ADI on Calle Martin de los Heros in Madrid, near the Arguelles Metro station. They have a decent collection of research level books organized by topic. The Stanford University Bookstore in Palo Alto, California. They have an online catalog, although it's unclear how complete it is. Not the answer you're looking for? Browse other questions tagged soft-question big-list books or ask your own question. Research level applications of “row rank = column rank”?